Dr. Maureen Callahan loves being able to give her patients the best that dentistry has to offer at Southtowns Dental. Committed to the comfort and care of her patients to ensure healthy teeth and a beautiful smile, Dr. Callahan is a general dentist who has a way with patients of all ages. She has a comprehensive approach to patient care to ensure lasting results. With an interest in pediatric dentistry and orthodontics, Dr. Callahan makes sure you and your family feels secure in her care. She is a graduate of Mount Mercy Academy, and Saint Mary’s College in Notre Dame, Indiana. Dr. Callahan received her D.D.S. from the University at Buffalo’s School of Dental Medicine, with a minor in Pediatric Dentistry. She honed her pediatric skills at Women and Children’s Hospital of Buffalo dental facilities. She is experienced with gentle sedation (nitrous oxide) and local anesthetic on all patients, and is certified in straight wire orthodontics and Invisalign. She offers the full menu of orthodontic treatment to achieve your best smile! She is a graduate of Mount Mercy Academy, and Saint Mary’s College in Notre Dame, Indiana. Dr. Callahan received her D.D.S. from the University at Buffalo’s School of Dental Medicine, with a minor in Pediatric Dentistry. She honed her pediatric skills at Women and Children’s Hospital of Buffalo dental facilities. She is experienced with gentle sedation (nitrous oxide) and local anesthetic on all patients, and is certified in straight wire orthodontics and Invisalign. She offers the full menu of orthodontic treatment to achieve your best smile!Dr. Callahan completed training through the Academy of Straight Wire and Functional Orthodontics, and is a member of the American Dental Association, Academy of General Dentistry, American Orthodontic Society, Association of Women Dentists, and American Academy of Dental Sleep Medicine. To stay on top of new techniques, she has taken hundreds of hours of continuing education. She offers advanced solutions such CEREC and implant restorations, and provides general dental and orthodontic care. Dr. Callahan completed training through the Academy of Straight Wire and Functional Orthodontics, and is a member of the American Dental Association, Academy of General Dentistry, American Orthodontic Society, Association of Women Dentists, and American Academy of Dental Sleep Medicine. To stay on top of new techniques, she has taken hundreds of hours of continuing education. She offers advanced solutions such CEREC and implant restorations, and provides general dental and orthodontic care. 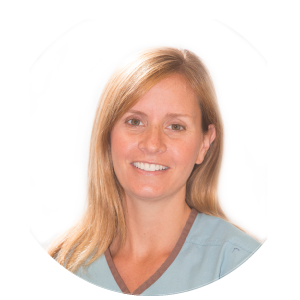 Other than being one of our five fantastic dentists, Dr. Callahan is the mother of six children. She is an avid runner who ranks among the top woman master runners in the Greater Buffalo Area. She has completed seven marathons, numerous half marathons, and countless road races often with her husband. Dr. Maureen is a member of the St. Apollonia Dental Guild through Catholic Charities, which allows her to use her dental skills to perform procedures on people who would not have otherwise been able to afford dental care. Dr. Callahan looks forward to helping you and your family be healthy and have great smiles.